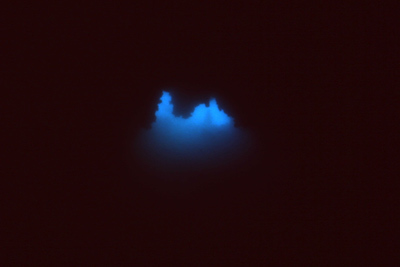 Michael McFadyen's Scuba Diving - Chandelier Cave The nation of Palau is located 960 kilometres to the east of the Philippines and about 7 degrees north of the equator. As well as the sites of Blue Holes and Blue Corner, there is the fabulous Chandelier Cave. Only five minutes from the Resort, the cave is located under one of the Rock Islands. The entrance is in a depth of 3 metres and the cave extends back about 100 metres into the island. 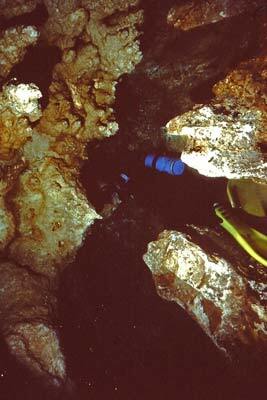 Consisting of three large caverns, the depth of the first is about 18 metres and there are air pockets in each cavern. In the last one you can stand up almost completely out of the water. The cave is a limestone cave, much like NSW's Jenolan Caves, formed millions of years ago. There are stalactites extending down from the roof, some submerged in the water and some still forming. The floor has stalagmites that are as old as the cave itself. 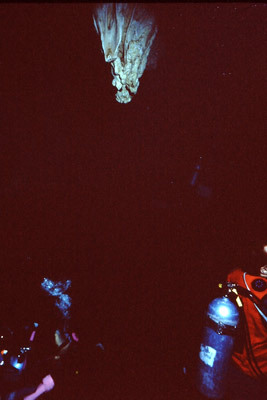 The water inside the cave is crystal clear and your fellow divers seem to float in mid-air. I spent a considerable time in this cave and was quite fascinated by it. It is extremely safe and you cannot get lost as the cave system is not too big and any connecting "tunnels" are very large. Michael McFadyen travelled to Palau courtesy of Dive Adventures (02-9299 4633), Continental Airlines, Air Micronesia, Palau Pacific Resort and Splash.